There are few careers in big-time modern American moviemaking like David Fincher’s. Where almost everyone else in the last two decades has felt obliged to define him- or herself right out of the gate, Fincher has evolved from movie to movie. If you were to go back and look at Se7en or The Game in light of the director’s recent work, you would see the same refinement of light and space, the same level of emotional engagement with his actors, the same narrative precision, even the same aura of melancholy. One might have reckoned that the director of Fight Club and Panic Room would become one of the key artists of the digital age. (Indeed, from the beginning it was obvious that Fincher’s creativity and audacity were matched by his technical know-how.) I don’t think any of us, however, would have guessed that Fincher, with Zodiac and The Curious Case of Benjamin Button, would achieve a vision of time so heartbreakingly acute as to rival those of John Ford and Orson Welles. Every second of Benjamin Button, every shot and every cut, every gesture and every facial expression, every turn in its narrative and every visual effect, is devoted to the contemplation of time’s passing. Of course, that is the theme of Eric Roth’s screenplay, an epic embellishment of F. Scott Fitzgerald’s wisp of a story about a man who is born old and grows young, displaced from Baltimore to New Orleans and shifted ahead fifty years in time. And it is easy to imagine the film directed by someone else, anyone else apart from Fincher, and made into a poignant love story about two people who “meet in the middle,” set against the backdrop of the American century. I’ve read many descriptions of this phantom movie, Roth’s script as directed by Ron Howard or Nora Ephron. They are very far from the mysterious and troubling film Fincher has actually made. The narrative is a flashback invoked through readings from Benjamin’s diary by a young woman to her mother, Benjamin’s great love, Daisy, as she lies on her deathbed in a New Orleans hospital. The action officially “takes place” on August 29, 2005, as Hurricane Katrina is making landfall. There is also a second framing device, the fabulous story (recounted by Daisy) of a blind clock maker who fulfills a commission to the city in 1918 with a magnificent timepiece that will loom over the railroad station, ticking forever backward—his sad hope is that the clock will magically conjure his beloved son, shot down on a European battlefield, back to life. Benjamin’s own story begins at the end of the Great War, and encompasses a journey that takes him and us from a home for the aged, managed by his adoptive African American mother, across the seas to Murmansk (where he has an exquisite romantic encounter with the wife of a British spy, played with a wonderful bittersweet longing by Tilda Swinton) and the Pacific naval battlegrounds of World War II, and then to New York and Paris in the fifties and the Far East in the eighties. Along the way, we are afforded visions of a sunset on Lake Pontchartrain, a rocket lifting off from Cape Canaveral, Carousel on Broadway, and the Beatles on The Ed Sullivan Show. The picaresque/kaleidoscopic strategy of the script might be familiar to viewers of Forrest Gump, also written by Roth. 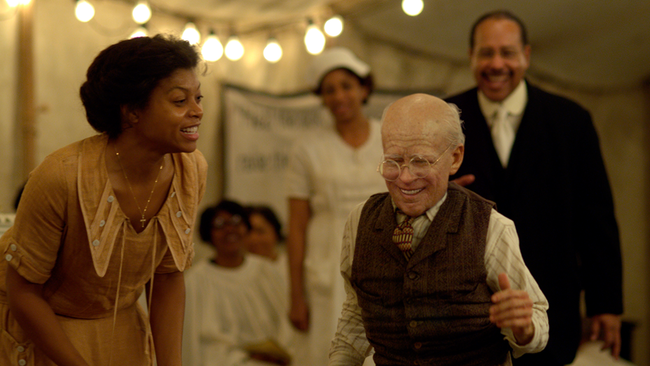 But Benjamin Button finally moves in a very different direction. Fincher never allows us anything more, or less, than glimpses, distilled into visions. That NASA liftoff stays on-screen just long enough to register before the director cuts away to another incremental but palpable step forward in time, and it is ephemeral (a brilliant streak of white light traced across a bright blue sky) more than iconic. It is also evocative of earlier streaks of light, sent by artillery fire in World War II and machine-gun fire in World War I, both flashing just as quickly—yet harrowingly—before our eyes. And Benjamin’s. The character of Benjamin Button, as embodied by Peter Badalamenti, Robert Towers, Tom Everett, a host of makeup and visual effects and animation specialists, and above all by Brad Pitt, is a remarkable creation. He is the withdrawn man who politely refrains from engagement until absolutely necessary, partly inspired by the director’s memories of his own father. He is the delicately hesitant man with the relaxed drawl who feels different to his core, who has made up his mind to sit and watch. He is the man who notes the passing of years, minutes, seconds of his own life with bewilderment, wonder, and sadness. Fincher has quietly built up to this character over the years, with Morgan Freeman’s ruminative detective in Se7en, Michael Douglas’s recessive tycoon in The Game, Mark Ruffalo and Anthony Edwards’s quietly contemplative cops in Zodiac. With Pitt, he achieves a character who not only breaks every dramatic rule in the screenwriting playbook but amounts to a potent and moving archetype. Benjamin Button as filmed is quite a distance from Fitzgerald’s arch conception, closer to Hawthorne’s Wakefield and closer still to Borges’s Fuñes, the man cursed with a perfect memory, but he is even more moving. His curious case is imparted to us not in thick slabs of sentiment but in small, exquisite fragments, delicately attuned to matters of mood, atmosphere, and behavior, over almost as quickly as they’ve begun—the feeling of walking into the morning air or through the stillness of twilight, of being alone at night in your own home or in a hotel far away, of having lived twenty years and then fifty. Just as in Zodiac, there is an extremely precise sense of what it’s like to be alive in a certain place, during a certain time, from moment to moment. It’s not just the curtains and the clothing and the music and the cars that are right, but the gestures, the sounds, the blending of the public and the private, the way that every sign of this or that zeitgeist (fifties bohemianism, sixties modernity) is filtered through personal experience. Fincher is a director who knows his craft inside and out. He is also an artist who knows what to use it for, which is why amazement over the seamless technical feat of creating Benjamin out of so many different sources and disciplines tends to disappear early on. In film after film made in the digital era, technical wizardry is the tail that wags the dog. For Fincher, it is just another expressive tool. The re-creation of Broadway in the fifties registers just as quickly and vividly as the devastated expression of an aging Daisy (Cate Blanchett) when confronted with the presence of Benjamin grown thirteen years younger. The jubilation of New Orleans on Armistice Day is just as fleeting as Benjamin at his physical peak soaring across the countryside on his motorcycle. And the film’s beautifully measured pace, set like Pitt’s performance to New Orleans time, never stops to linger over this or that technical achievement. Fincher stays true to the character and the story and the movie, and to his own bracingly frank understanding of the reality of time, from first moment to last. Kent Jones is the author of Physical Evidence: Selected Film Criticism, a volume of his writings, and the director of the 2007 documentary Val Lewton: The Man in the Shadows. A film he directed and wrote with Martin Scorsese about Elia Kazan is forthcoming.